10. 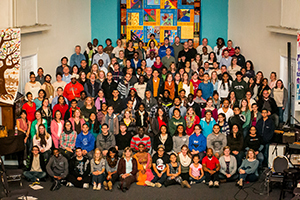 Over 200 UP workers from around the globe—Toronto, Honduras, Malawi, Wilmington, Trenton, Miami, Charlotte—visited Camden last week for renewal and training at our annual International Summit. I'm amazed how God continues to expand UP’s reach to our world's most vulnerable citizens. 9. Two new high schools built in Malawi, Africa, through UrbanPromise International—reaching over 300 of Malawi's most impoverished children to provide a quality education. 8. The birth of a new UP in Charlotte, NC. 7. The $2 million renovation of the Spirit Building in East Camden, providing a new cafeteria, gymnasium, computer center, and classrooms for our schools and afterschool programs. Thank God for our generous donors who have brought us this far! 6. The growth and impact of UP Camden's Wellness Center, providing counseling and training for children and teens beleaguered by toxic stress. 5. The expansion of Camden's UrbanTrekker program to Wilmington, Trenton, and Miami. 4. 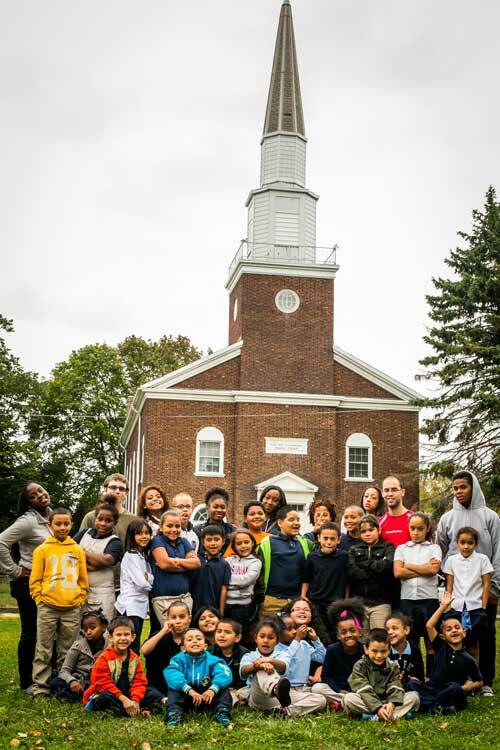 The purchase of the Fairview Community Baptist Church for $25,000, providing a home for a new afterschool program in the Fairview section of Camden. 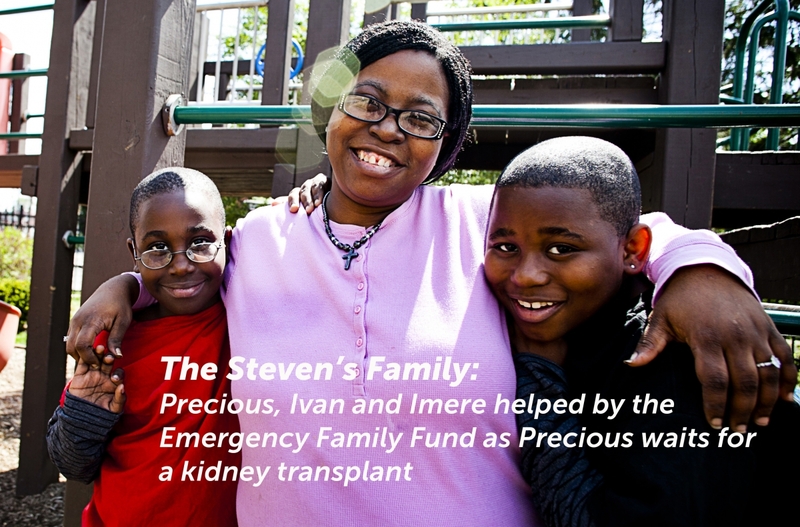 Thanks again for amazing donors who responded to our appeal. 3. Volunteers and donors who faithfully sacrifice time and treasure so UP can continue to thrive and grow. 2. A remarkable, talented, committed staff and board, who are some of the finest people I know. 1. The gift of spending every day in the presence of children and teens who dream and persevere in the midst of incredible obstacles. For these things, and so many more, I am abundantly grateful. Fall at Camp Spirit is always full of great trips and opportunities to hang out with the other UrbanPromise afterschool programs. Between pumpkin carving, hay rides with Camp Joy at Johnson’s Corner Farm, and getting scared silly with Camp Freedom at the Eastern State Penitentiary, there’s barely been time for our regular program! 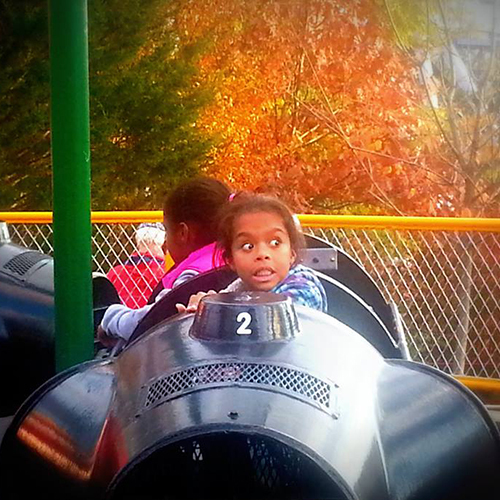 Of course, our visit to Hershey Park is always a highlight. Our interns have been amazing! Our newest (to UrbanPromise) intern, Jailene, has done a great job getting on board with all our different activities—she even made it through her first all-nighter! We've been really blessed to have Mark on staff for the first part of the year—he endured endless games of manhunt during camp night— so we were sad to see him leave us. The good news is that he’s now working full time in our UrbanTrekker Program, and his leaving means that we get to welcome Cat to our staff! Our bible focus so far has been on the fruits of the spirit from Galatians. Last week, our youth were challenged to perform some random acts of kindness … hopefully, there’ll be some stories to share about that soon. There have been a few challenges so far this year. 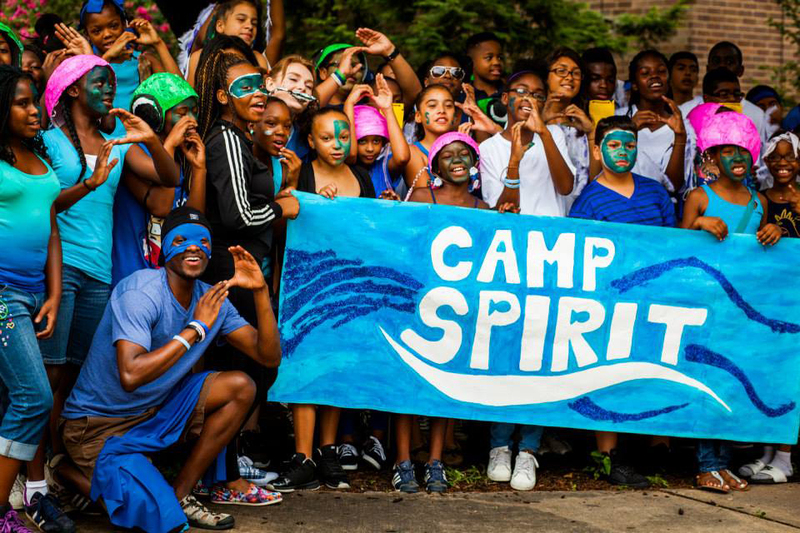 Renovation work is underway on the Spirit building, so camp has been relocated. We’re so grateful to the CamdenForward School for sharing their space with us over the summer and during the school year. It has been a lot of fun to be there, though we are all looking forward to getting “home” in 2014. Finally, we are so excited about our upcoming Thanksgiving dinner, when all of our families can gather together and enjoy a meal. It really does feel like one big family celebration! 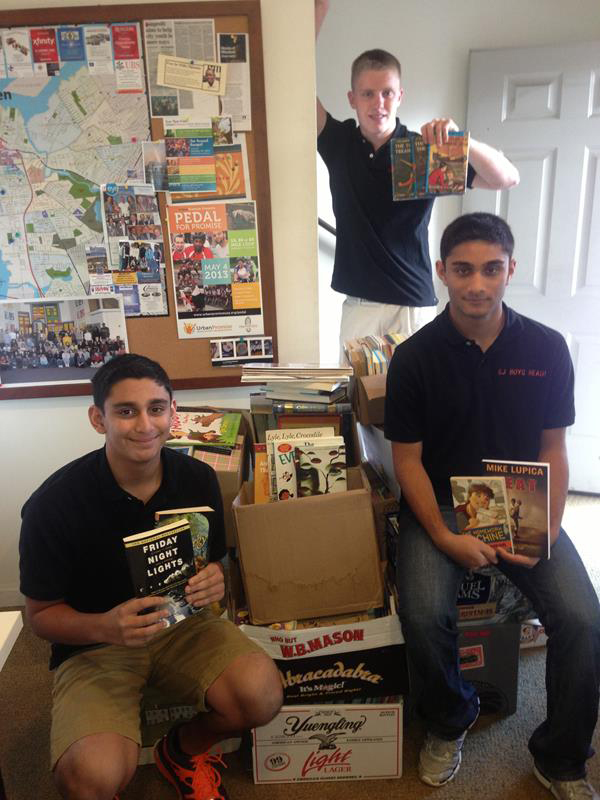 Over 1,400 books collected for high school! SJ Boys Read! collected over 1,400 books through their annual book drive in October. UrbanPromise Academy high school English teacher, Hillary Jones, was thrilled to the point of jumping up and down with excitement to be able to fill her classroom library with new selections for her students. Ms. Jones said that she normally has 20 books checked out of the classroom library at a time. With the flood of new titles, she has an unprecedented 70 books checked out this week! All of the staff and students of UrbanPromise would like to extend a sincere thank you to SJ Boys Read! and all those who donated books! We are grateful for your hard work and dedication to promote reading among your peers. For more information about SJ Boys Read!, please visit: http://www.sjboysread.org. We are all settled in and loving our new home at St. Augustine Episcopal Church. We have a cozy homework room set up, and our Camp Saved posters are on the wall—pictures going back 7 years. We are also having a blast performing on the stage in the Parish/Fellowship Hall. We have been making various crafts with Isa, our intern from Vancouver, and sharing her love of decorating cupcakes (we just made owl cupcakes!). Darnell, our intern from Camden, has been our game leader and has gotten us all into math with his famous Math Monday games. Lisa, from our staff last year, comes at least once a week with a literacy activity -- so now we have a hard time deciding whether to get our bonus points from practicing our math or reading a book! On top of all this, the Philadelphia Zoo On Wheels has come to visit us 3 times, bringing all kinds of animals for us to learn about. We even visited the Zoo itself for free and brought some of our families! We have been learning our Bible, too. We studied the Creation story—seeing all those animals we loved at the zoo, we just gotta say, God's creativity is amazing! We even put together a Girls Choir and sang in front of over 300 people at Hope United Methodist Church. As you can see, we have been very busy, but we’ve been taking time for just plain fun, too. We celebrated Halloween with a Harvest Carnival, playing games like ring toss and, of course, winning candy. 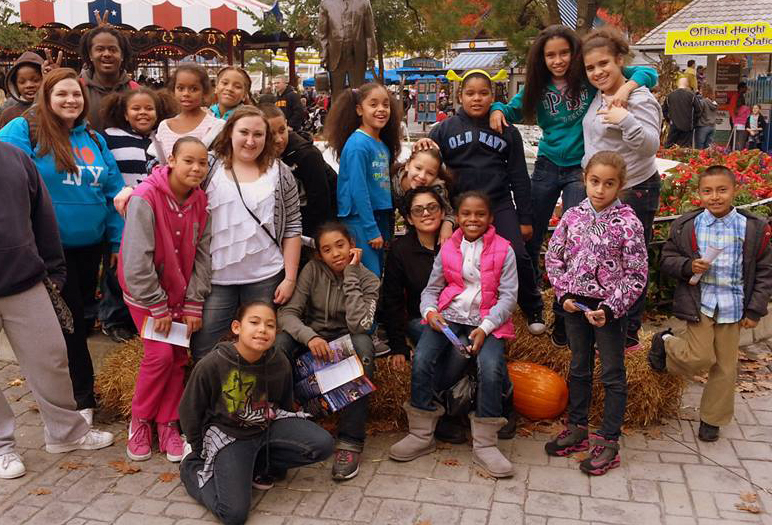 The 3rd and 4th graders enjoyed an annual trip to Hershey Park (with more candy!). 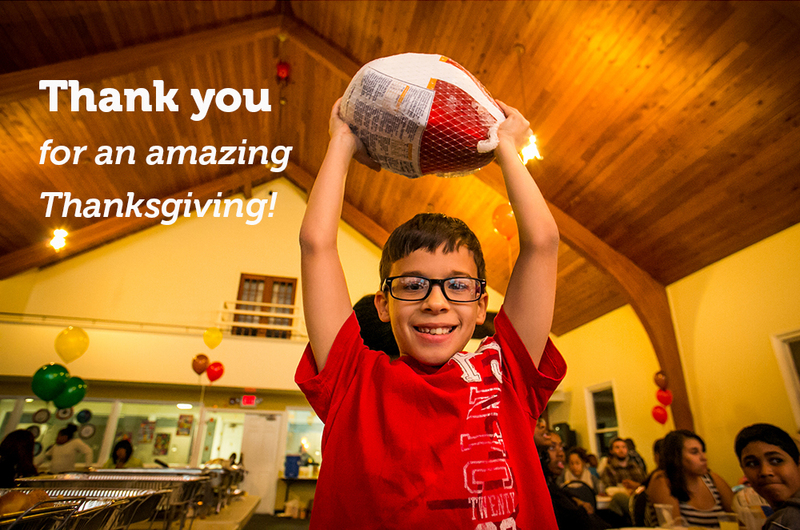 Next up is celebrating Thanksgiving together with our annual Camp Saved Family Night Dinner. We invite the whole family, enjoy a turkey dinner, and share what we have been up to at Camp Saved. Don't worry—no candy—got to ease up on that. Just PIES for dessert! The unexpected gift of gutters! This past summer UrbanPromise’s CamdenForward School suffered costly water/mold damage in part due to our outdated gutters and drainage system. This fall we reached our to Walt Koenig (a long-time friend of the ministry) for a quote to replace our gutters. We were incredibly blessed when Walt gave us the best price a non-profit could ask for - $0! That’s right, K&K Seamless Gutters of Moorestown has graciously donated not only new gutters but also all the labor. 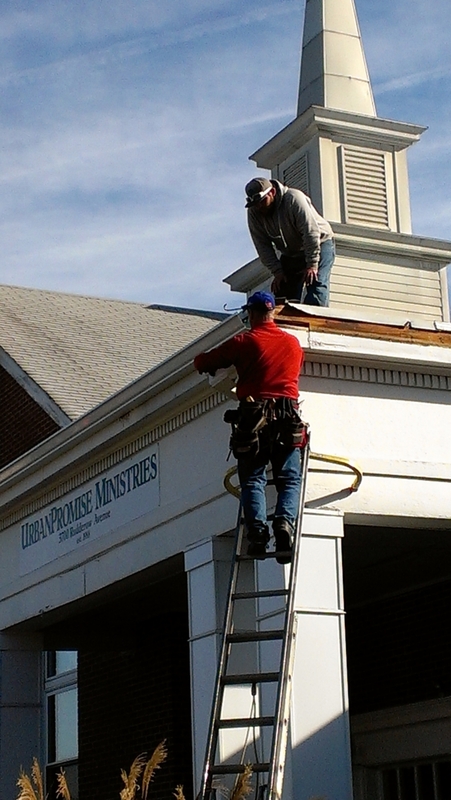 Next time you visit UrbanPromise be sure and check out our awesome new gutters! Thank you Walt! Give a gift that will bless a family this Thanksgiving! During the week of November 25th, UrbanPromise will feed over 600 children and adults in neighborhoods around the city of Camden—a huge undertaking. Our dedicated teams of staff and volunteers will prepare the food—turkeys, potatoes, collard greens, even pumpkin pies—and spend hours bringing families by bus to our sites. It will cost UrbanPromise about $5.00 to feed each guest. 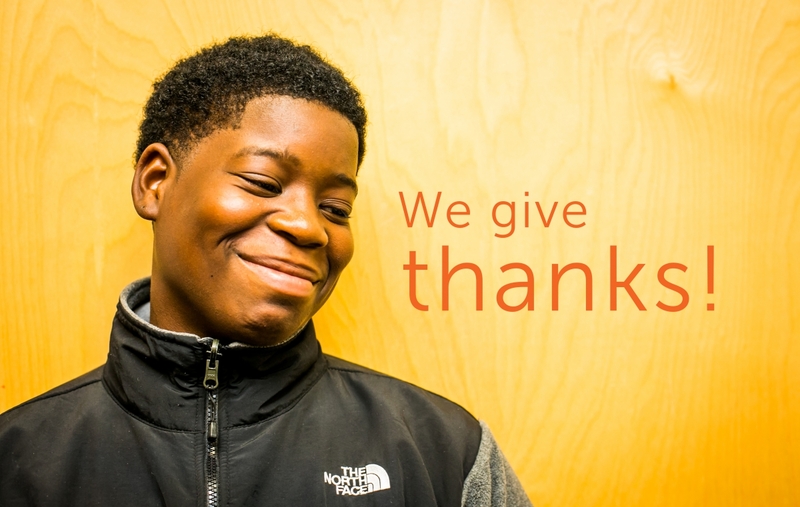 But Thanksgiving dinners at UrbanPromise are so much more than delicious food served on paper plates to groups of strangers; they are ultimately Celebrations of Gratitude. Our annual neighborhood dinners are about building community, uniting families, and taking time to reflect on God’s goodness and generosity. Thanksgiving dinners are really about practicing gratitude, together. Help make it possible for our team to provide these great Celebrations of Gratitude! For $500, you can underwrite the cost of a dinner for 100 people. For $150, you can help 30 kids learn the amazing gift of giving thanks. And for $25, you can give a family of 5 a joyful night out. As you plan your own family festivities, help us create community Celebrations of Gratitude. I wish you and your family a wonderful Celebration of Gratitude, too! As a child, I took stability for granted. I lived in the same house, attended the same school, slept in the same bed, studied at the same desk each year, and always knew where my school clothes were hanging. I had little appreciation for the life-transforming gift of predictability. A subject that is seldom mentioned in discussion of the issues confronting Camden is the mobility of families, and how it affects children. Mobility may seem to be a benign concept having limited social implications….unless you are a child who moves two or three times a year. Tragically, Camden, New Jersey, has one of the highest mobility rates in the country, topping out around 37% (that’s 27% above the state average). Many of us never experienced the fear of walking into a new classroom mid-year, knowing we were 3 months behind the class. Never did we have to experience the anxiety of trying to learn a new locker combination multiple times a year, never did we lose our position on our beloved athletic team due to a mid-season move out of the district, and never did we have to spend hours looking for lost dictionaries or calculators, school supplies recklessly thrown to the curb in a garbage bag because our family was unexpectedly evicted. Sadly, many children at UrbanPromise experience these circumstances. Sixth grader Deja is an example. A bright girl, Deja really loves our Camp Freedom. She never misses a day. The counselors are her best friends. She’s one of those kids who always seek extra tutoring just so she’ll be perfect—and she never misses the snacks. Camp Freedom is home for Deja. It’s family. It’s a place where she’s allowed to be a kid. 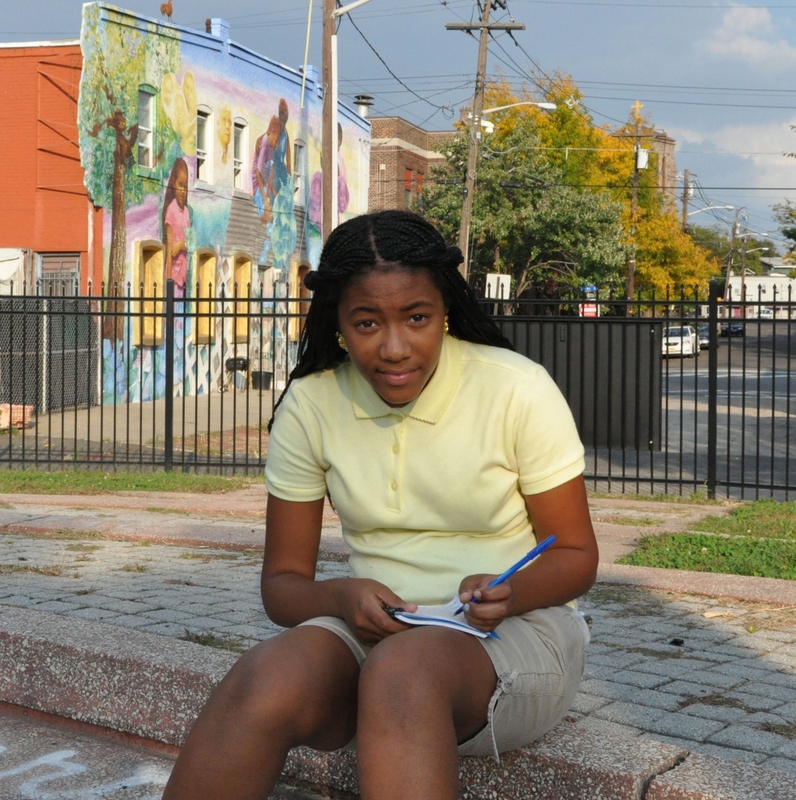 Recently, however, Deja’s mother had to move out of south Camden, over to the east side of town. 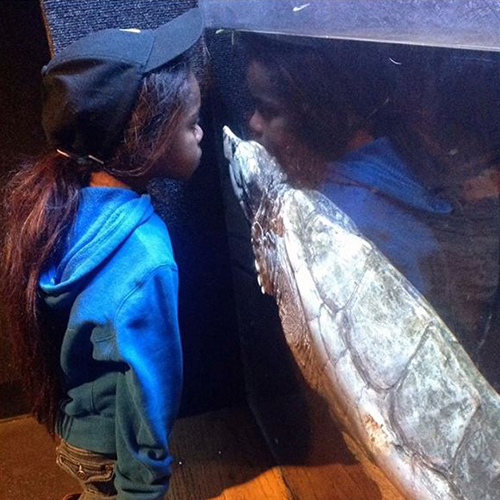 Due to certain circumstances, she lost custody of Deja. Fortunately, her aunt stepped in to help. Without a choice, Deja had to move, and consequently, she had to give up her place at Camp Freedom. It’s no surprise that determined Deja was ready and waiting every morning. Deja’s early morning readiness made a statement. She needed and wanted stability. When life is tumultuous, children need an anchor. 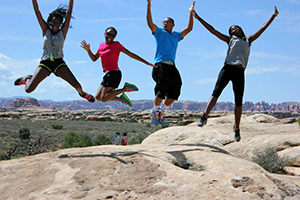 UrbanPromise’s Camp Freedom and our AfterSchool Programs are where children experience warm and caring stability. Jesus told a powerful and intriguing story in Luke 15. It was about a shepherd who left the 99 sheep he was tending to rescue just one lamb that had wandered off. It’s a compelling and challenging parable, affirming the individual as important to God. It warmly shouts that in God’s economy, everyone matters. When I read Jesus’ parable, I think of Deja, Tony, and all that makes UrbanPromise a special and unique organization. Like the shepherd who watches over his flocks, leaders like Tony Vega are fighting for the lives of Camden kids every day, refusing to let any child fall prey to the chaos and instability of their environment. Currently, there are 167 children like Deja who still need sponsors for this school year. For just a dollar a day—$30 a month—you can provide stability in the face of turmoil, and change a child’s life. Thank you in advance for your help!When I read Jesus’ parable, I think of Deja, Tony, and all that makes UrbanPromise a special and unique organization. P.S. I've included a poem that Deja recently wrote about going to UrbanPromise. What’s my name again, you ask? Am I the stereotypical image of Camden. No. I’m a Camp Freedom kid. The phone call seemed too good to be true! After 80 years of ministry, Fairview Community Baptist Church was closing its doors, and the few remaining members wanted UrbanPromise to buy the building. For the past year, UrbanPromise staff has been looking for a new location for an afterschool program and summer camp in the city. We wanted to expand our outreach. But some buildings were too old, some were in neighborhoods not conducive to outreach, and others were just too expensive. Then we received the call. The location was perfect, the building was in great shape (a few necessary repairs, but structurally strong), and the price . . . well, $25,000 for 3500 square feet of program space and a 3-bedroom manse is hard to refuse. Perfect, in fact. hundreds of children. It’s a tremendous opportunity to influence a new generation of young people through programs that challenge academic development, life skills, faith development, and Christian leadership. In our meetings with the church leaders, we learned that Fairview Community Baptist was originally established as a Sunday school for children in the Fairview section of town. For years, the church impacted generations of children through outreach and Sunday school classes. The Good News is that Fairview Community Church is returning to its original roots—a place where children and teens can gather and experience the love and grace of God and mature as leaders. 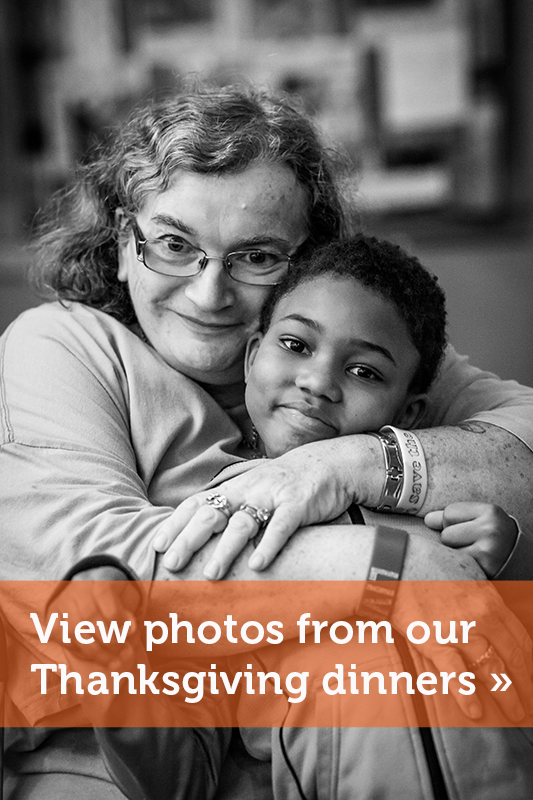 When the original appeal was sent to the UrbanPromise donor family, the response was overwhelmingly affirming and positive. You responded, and sent a clear message that you want to see UrbanPromise continue to grow and expand in Camden. Thank you! Thank you for believing in this vision. Thank you for making an investment in the children of this neighborhood.